Note: This is currently only available to VeloViewer PRO users. 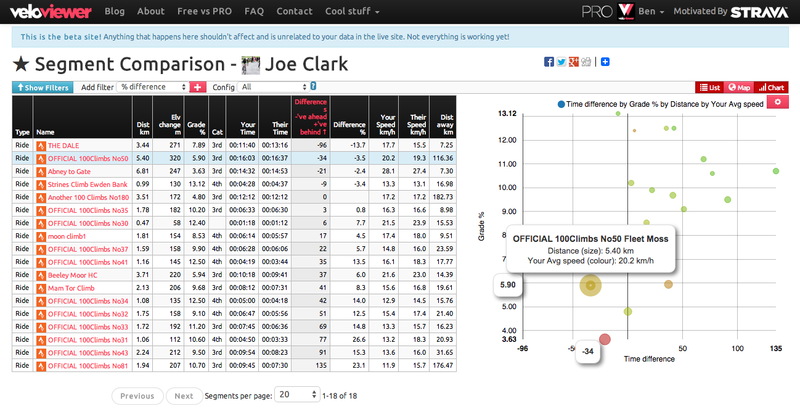 First up, the Rivals page has been updated so that every athlete listed now has a direct link to the comparison page even if they are not on VeloViewer. The Friends list has also been extended so that it now includes all of your friends with only those on VeloViewer showing scores. If the user you are comparing to is also on VeloViewer (and has marked their data as public and has also started using the beta site) then you get the full list of all of your intersecting segments with maps and charts very similar to what you had before, although it should load up much faster! It will say “All Segment Comparison” in the heading. If the user you are comparing to is not on VeloViewer (or has their data marked as private or hasn’t used the beta site) then your Strava starred segments will be checked against the other athlete and if they have also completed them a comparison is provided. Each of your starred segments that they haven’t ridden will be removed from the list. It will say “★ Segment Comparison” in the heading. I’m currently looking into easy ways for you to deep dive into this comparison page from Strava but for the time being the only direct links you’ll have are those in your Rivals page. For the slightly more tech-savvy out there you’ll easily notice that the Strava number for the athlete you are comparing is in the page’s URL so you can just swap that out for any other Strava athlete’s number and hey-presto, there you have it. These are easy to find by clicking on any other athlete’s name in the Strava website – this will take you to that user’s profile and their number is in the URL. Why just the starred segments? 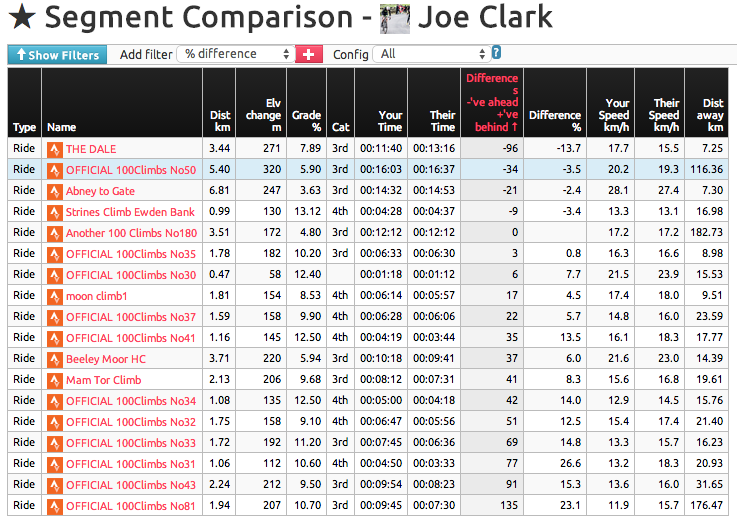 In order to generate the comparison the page checks for the best effort for the other athlete against each of the segments via a Strava API call so attempting to check all of your segments is a complete non-starter as many people have 1000’s of segments! The starred segments in Strava may well serve some other purposes for some people but in general it is used for marking out the best or most important segment to you. The more people that use the starred segments in this way then the better Strava’s algorithms can get around hiding annoying duplicate segments and providing segments searching. Let me know if you’ve any issues or ideas for this new comparison page. Main goal: Speed up main page loads and some of the steps of the update process and remove the need for local browser storage. How? : Remove the MySql database performance bottleneck from the equation and store data in a more simple, quicker access location. Segments list in Activity Details now load immediately. A couple of the troublesome steps in the update process. In order to store the data in the new structure it involves an initial reload of your activities on the beta sites Update page but all the segment placing are migrated across. The plan is that once I’ve moved all of the functionality across to run off of the new data model then I’ll make the switch of the functionality over to the live site so free users can also get the performance improvements. As far as I’m aware the only page left for me to convert is the signature image. So if you haven’t done so already then have a go on the beta site and get your data migrated over as that will lessen the burden on the Strava API rate limits when I make the switch.